I've got some for you! 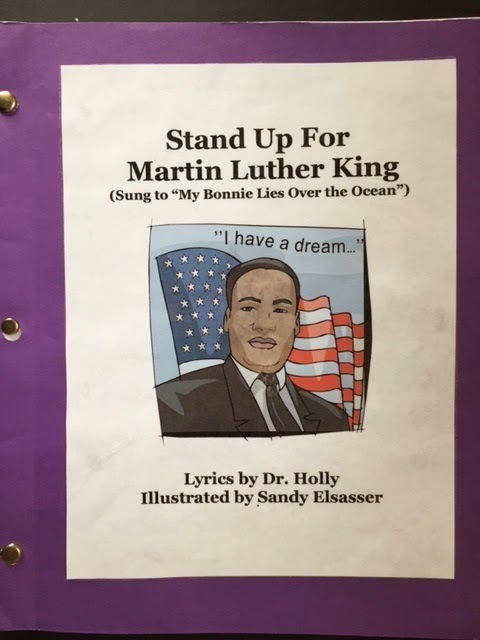 I was excited when Sarah Antos asked if she could use my song to create a word wall and book for her students. And I was thrilled when she said you could download it FREE! 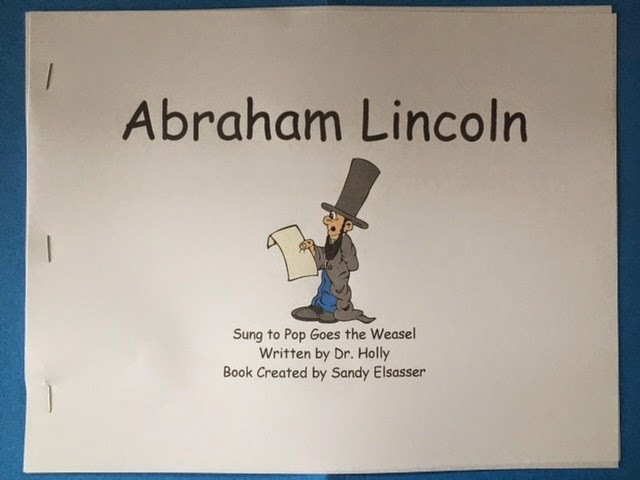 February 12 is Abraham Lincoln's birthday. You might want to integrate one or two of these ideas in your lesson plans next month. 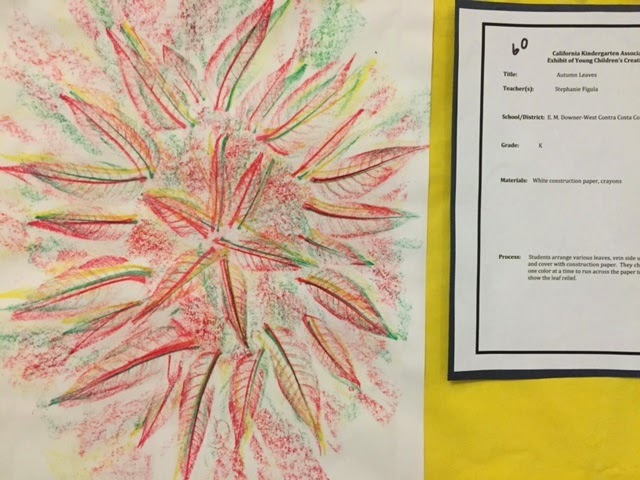 I've done crayon rubbings on leaves before, but I've never done them with several different colors of crayons. Lovely! Goodness gracious, it's getting close to the end of the month. Where does time go? Over the next few days I'll be sharing activities for your February lesson plans. Be sure and visit groundhog.org for more great resources, cutouts, games, etc. 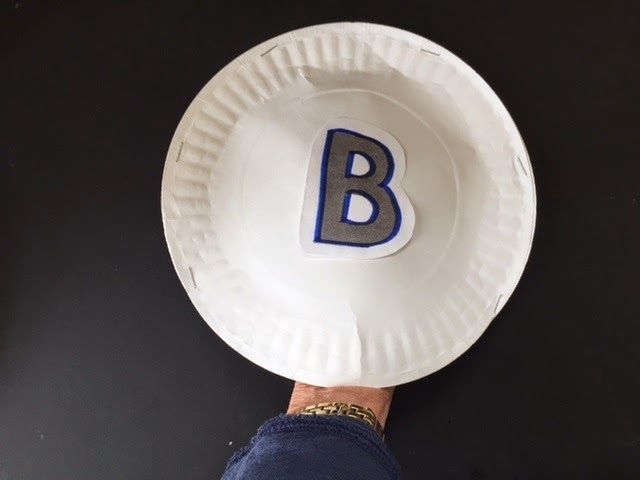 This is a simple idea that will engage all of your students and can be used in a variety of ways to reinforce math skills. It's perfect if you finish a lesson early or have five minutes at the end of the day. 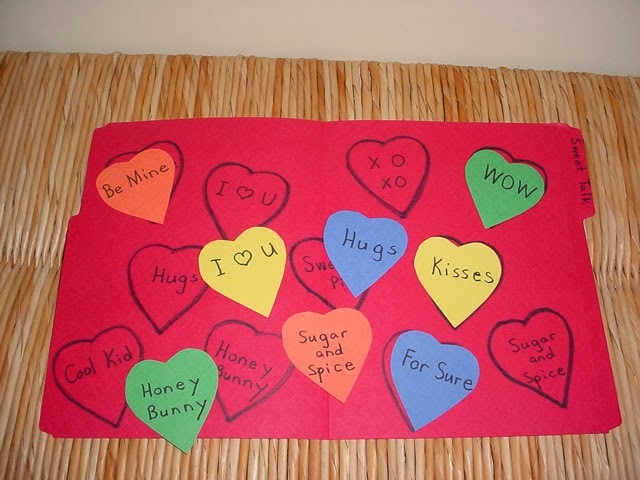 Make a set of “show me” cards for each child by writing the numerals 0-10 on 3” squares of heavy cardstock. Have children store these cards in a zip bag in their desk. 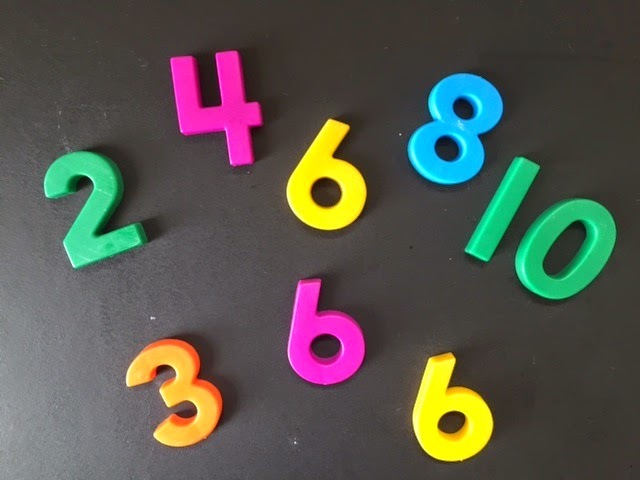 When you have a few extra minutes, ask the children to get their cards and arrange them on the floor or table in numerical order from 0-10. Use the cards for some of the games below. Skip counting is counting in multiples and a way to help children with multiplication. Of course if you sing and move it will be much more fun and will “stick” in the brain. THREE, FOUR, COUNT SOME MORE! Using real objects is also critical to developing number sense. Here are two simple tools that connect the oral with the concrete. 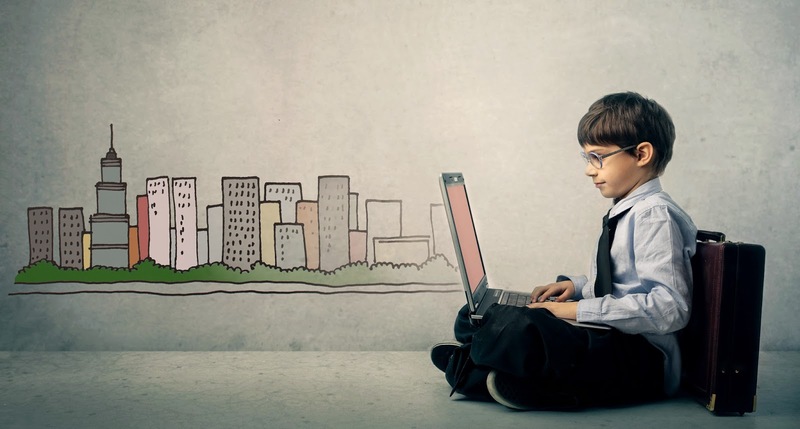 Isn't it amazing that many young children know how to navigate the web, but they do not know how to tie their shoes? Here’s a clever idea from Allison Caspers. She gets a suitcase and puts an old shoe in it along with one of the poems below. Each night a child gets to take home the suitcase and practice tying the shoe. 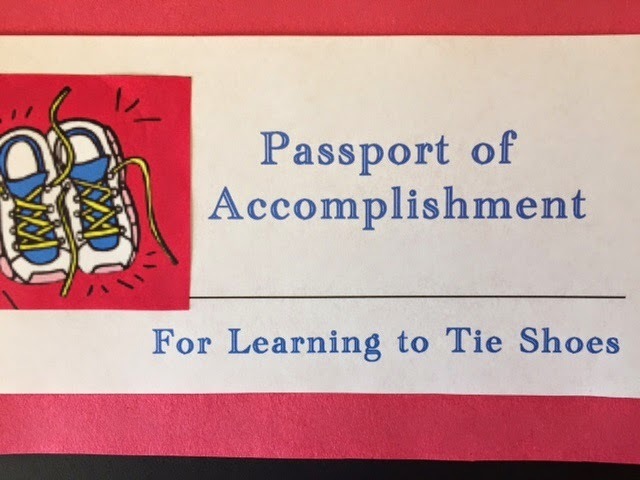 When they have completed their “Shoe Tying Journey” they receive a PASSPORT OF ACCOMPLISHMENT for learning to tie their shoes. Wouldn't "Puzzle Day" be a great way to end your week? Invite children to bring puzzles from home on Friday. During the last 30 minutes of the day have a puzzle party where they can do puzzles with their friends. Model writing a sentence on a sentence strip. 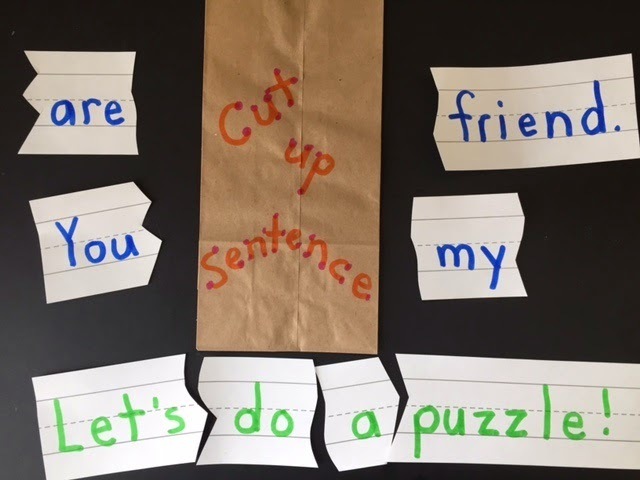 Cut between the words and then put the pieces in a lunch sack. Shake! Who can put the words in the correct order and read the sentence? Let children make their own sentence puzzles and share with friends. I'm off for the CA Kindergarten Conference in Santa Clara this morning and I'll be hunting for some new projects and ideas to share with you. Did you ever sing the song "Make new friends, but keep the old. One is silver and the other is gold..."? This rings true in early childhood. We want to be ready and excited to try new things, but we also need to treasure activities and materials that have always worked with children. Puzzles are one thing that will never go out of style, and to celebrate National Puzzle Day on January 29th, here are some "old" and "new" activities with puzzles. National Kazoo Day is January 28th. Ask your students to bring in paper towel rolls. (For sanitary reasons it is best to collect paper towel rolls rather than TP rolls!) Cut the paper towel rolls in half and punch a hole ¾” from the top. Let children decorate the cardboard rollers with markers or crayons. 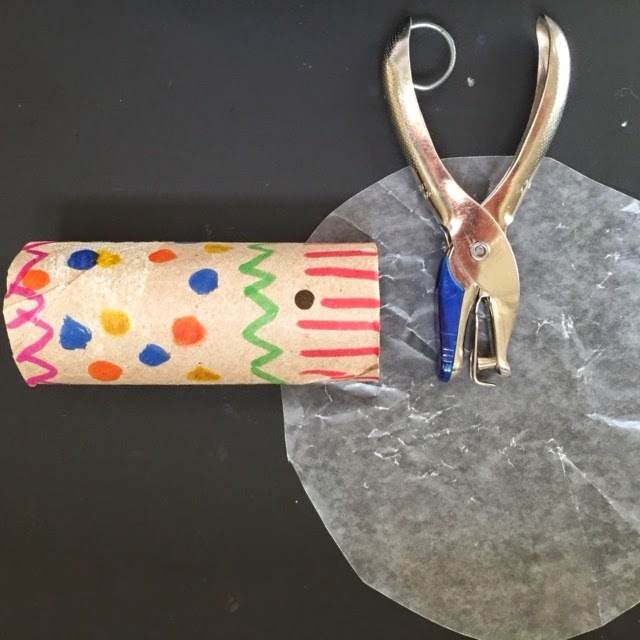 Cut 6” circles out of wax paper and use a rubber band to attach to one end of the roller and you’re ready to hum. March around the room as you hum some of your favorite songs. Several days ago I shared ideas to start your day. Here are some activities to end your day with a smile and a song. Hint! If you don't know the tune to a song simply put it in your search engine and you can probably find a youtube video with the arrangement. Children form two lines facing each other and begin moving their hands in a circular motion like a car wash. One child at a time walks down the center of the car wash as friends gently touch them and say something positive about them. 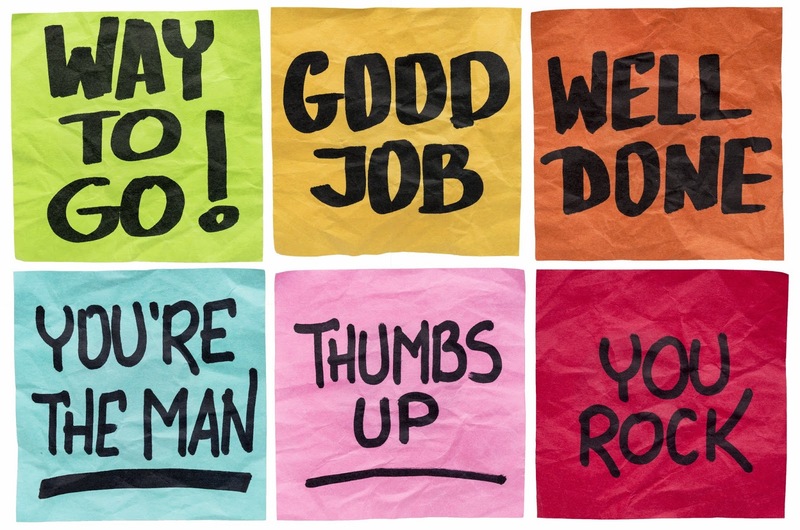 January 25 is Compliment Day. What is a compliment? How do you feel when someone gives you a compliment? What are some different ways you can compliment someone? How many compliments can you give during the day? January 25 is also Opposite Day. (I think I smell some standards here!) Reverse the daily schedule by starting the day with your good-bye song and ending with a good morning song and the morning message. Say your Z Y X’s (alphabet backwards) and count backwards. Turn around in your chairs and face the back of the room. Read a book backwards. Oh, and don’t forget to eat your dessert first at lunch!!! Need a new idea to start your day this week? Bet you’ll find one that’s just right for your class. Children stand in a circle holding hands. The teacher looks at the child on her right and squeezes their hand. That child looks at the friend on her right, squeezes their hand and sits down. The second child looks at the friend on their right squeezes their hand, and sits down….Continue passing the hand hug until everyone is sitting quietly. 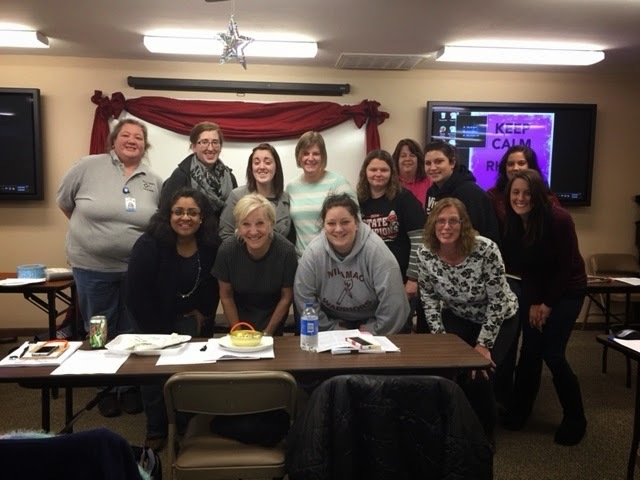 I’m back home from a visit to Indiana this week and although the weather was frightful, the teachers were delightful! They held my hand through the ice and snow and warmed my heart. 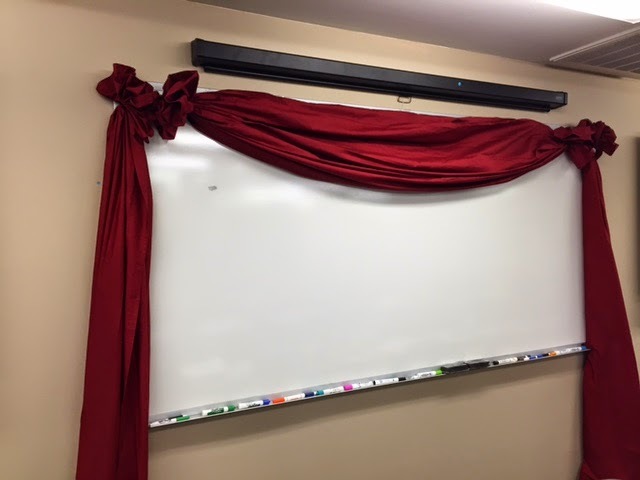 Don’t you love this curtain around the interactive white board? The teacher said she bought sheets, tied the ends with ribbons, and then hung them on hooks. Show time! January 21 is National Hugging Day. Could anything be better than a hug on a cold winter day? Let children make a list of people they like to hug. Hint! If your school is cautious about hugging, demonstrate how to give an air hug by squeezing your arms in front of you. “Hug” in sign language is done by making fists and wrapping your arms around your chest. Show your students how to give a “hall hug” to friends by crossing your index and middle fingers and wiggling. January 18 is Thesaurus Day. What a perfect opportunity to show your students what a thesaurus is and model how to use it. January 19 is National Popcorn Day. 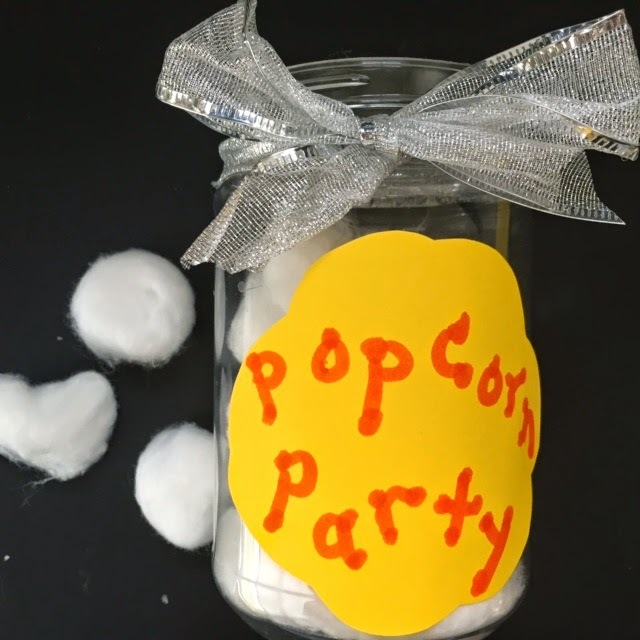 Put a clear jar on your desk and every time your students have good behavior put a piece of popcorn (cotton ball) in the jar. When the jar is full they earn a popcorn party. Give children something to look forward to every Friday during the dreary winter months while planting a love of poetry in their hearts. Write a note asking each family to send in a box of instant hot chocolate and an old coffee mug. Explain that you will end each week with the “Poetry Café” where children can listen to poetry, recite poetry, and enjoy a mug of hot chocolate. This will be an engaging way to develop listening skills, oral language, and an appreciation of literature. Cut mittens out of a wallpaper book or wrapping paper. (It’s easy to find a mitten pattern on google images.) Cut two out of each pattern and then mix them up. Give children clothespins clip the two that go together. 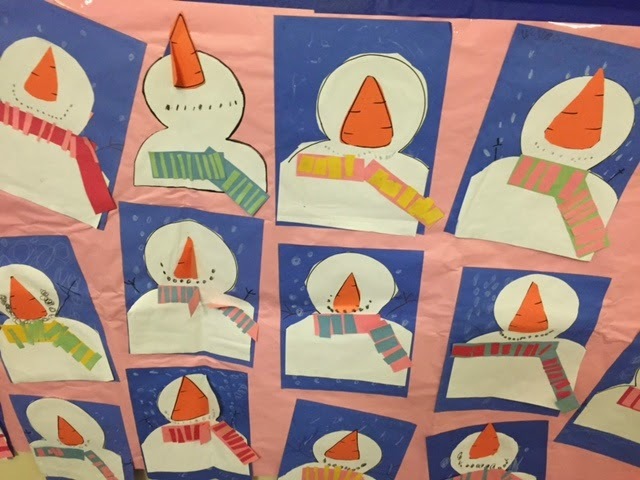 Introduce vocabulary to describe various patterns, such as “stripes,” “checked,” “plaid,” “solid,” “polka dots,” “animal print,” etc. 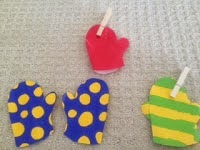 Make a mitten match game with upper and lowercase letters, synonyms, math facts and answers, etc. Hide mittens around the room for children to find and match. 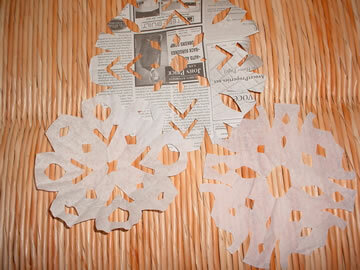 Here are some "snowy" projects that will provide January fun whether you live in Florida or Alaska. Dr. King’s birthday is just around the corner. Here’s a song my daughter Holly wrote that I am so proud of. The meaning of the song and the vocabulary you can teach are powerful! Dr. King stood up for children. Stand up for Martin Luther King. Stand up for Dr. King. Are you busy working on your lesson plans today? Here are a few ideas for the first few days this week. Here's a great idea to start the New Year. It's free, simple, and could engage families in a meaningful way. All you have to do is go to my website (drjean.org) and click on free activities. Scroll down to the parent resources and you'll find an activity calendar you can send home at the beginning of each month. 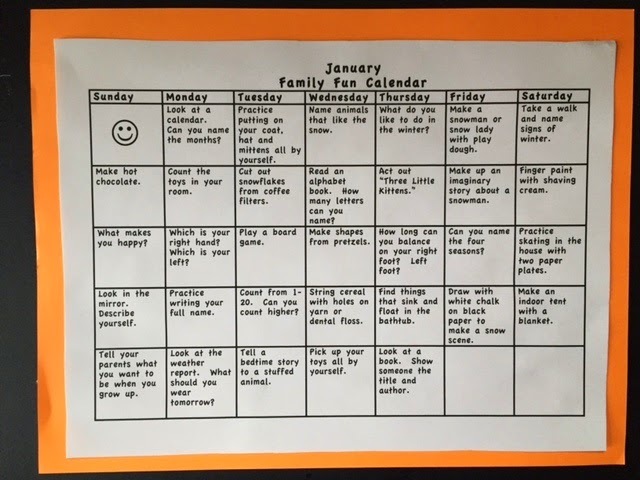 Ask the parents to do 5-10 of the activities during the month and return the calendar to school at the end of the month. When my daughter first saw these calendars she said, "Mom, that's really cool." I said, "Would you do those things?" She replied, "Of course. I just don't think about doing those things." Most of your parents are like my daughter, but if you give them a prompt something special might happen. Let’s get this New Year started with a new video and song download. 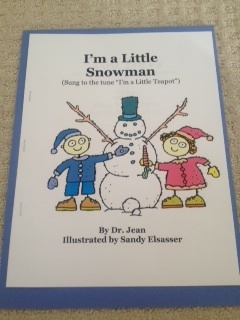 If you go to my website (drjean.org) today you can see a free new video, and you can download my “Jump Rope Rally” song. Jump roping is a fantastic form of exercise and can be done in a small space. Jump ropes are optional…just jump and pretend you have a rope in your hands. 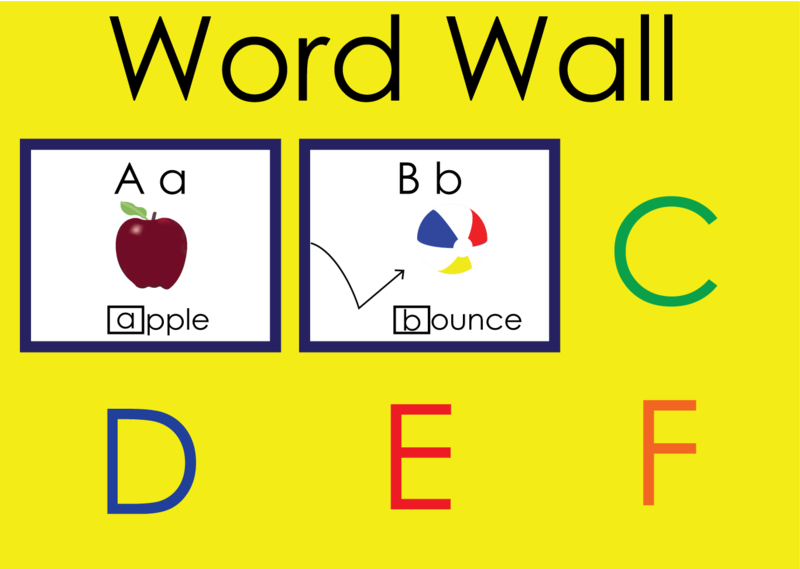 Oral language, counting, and phonological awareness are peripheral benefits of “Jump Rope Rally.” You can also jump as you say the alphabet, the months of the year, the days of the week, read the word wall…Whew! You’ll find lots indoor games on my website, as well as five minute flash card games to reinforce skills. You know, all you have to do is call something a “game” and your students will want to play. These games support ACTIVE LEARNING because they are multi-sensory and engaging. 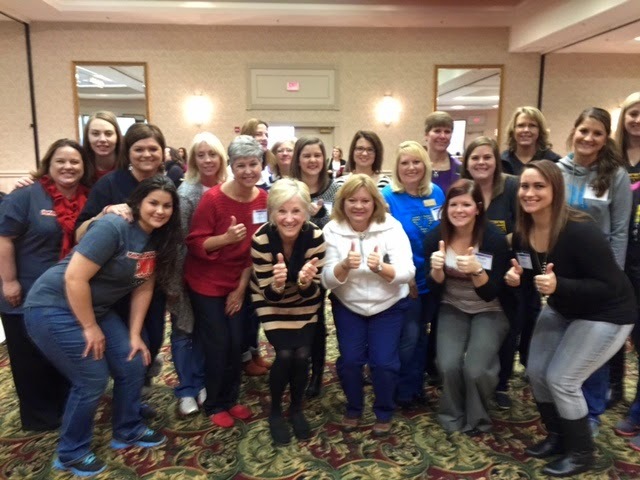 They also provide PURPOSEFUL PRACTICE FOR AUTOMATICITY (a.k.a. repetition for skill mastery). Most of the games are open-ended so all you have to do is insert your specific standards and skills in them and you’re ready to play and learn! I'm getting ready to JUMP into a new workshop season. I'm so thankful I still have a job that I LOVE!